NETWORK UPDATE: THE BIG BANG THEORY gained 0.2 in final numbers, but THE ODD COUPLE declined by 0.1. Elsewhere, BACKSTROM found an extra 0.1, but REIGN fell 0.1. Spike’s LIP SYNC BATTLE held top honors for Thursday cable, down 0.12 to 0.84. VIKINGS (History) was down 0.06 to 0.74. 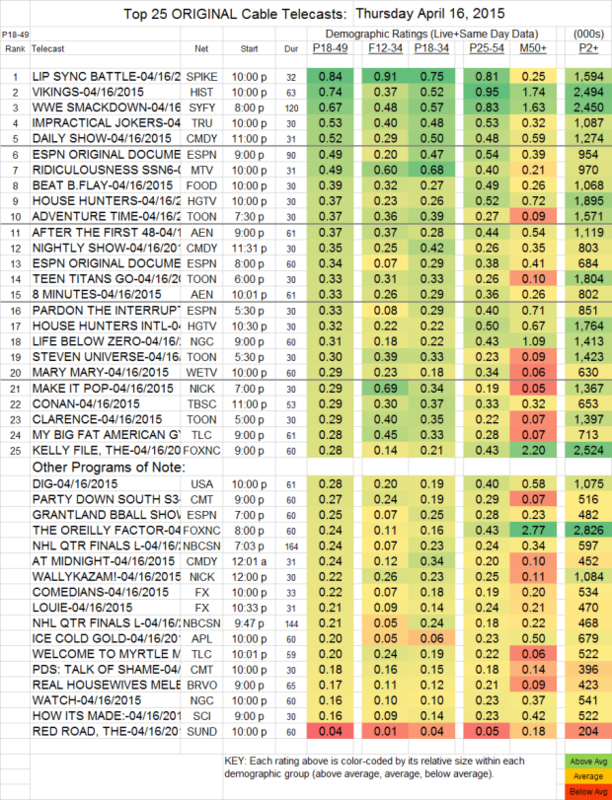 Syfy’s WWE coverage dropped a tenth to 0.67. On Tru, IMPRACTICAL JOKERS gained 0.06 to 0.53. ESPN aired back-to-back 30 FOR 30 documentaries, with 0.34 in the 8PM hour and 0.49 at 9PM. MTV’s RIDICULOUSNESS rose a tenth to 0.49. On A&E, AFTER THE FIRST 48 was at 0.37, and 8 MINUTES gained 0.03 to 0.33. MARY MARY (We) fell 0.04 to 0.29. USA’s DIG increased by 0.02 to 0.28. Word of mouth wasn’t kind to FX’s THE COMEDIANS, down 0.15 to 0.22, and LOUIE dropped 0.05 to 0.21.